Identity Diet is a comprehensive identity theft protection program and published book which introduces and explains identity obesity as a major root cause of identity theft, and offers 8 identity protection principles referred to as Identity KAOS. Most of us have either been victims of identity theft or know someone who has suffered from this crime. The fact is identity theft continues to grow affecting many people, and has a greater impact on high value identities which provide a bigger bang for the buck. High net worth and high credit score individuals are among those on the list of high target identities. The increased probability of identity theft occurrence along with the identity theft impact create a huge risk that should not be ignored and in fact should be dealt with utilizing the latest fraud prevention and detection methods available. Consequences of identity theft may include private information disclosure, identity fraud, criminal accusations, ruined credit score, and negative media attention. 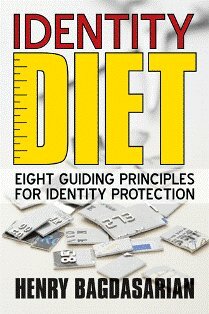 The Identity Diet book teaches about identity theft, how to prevent, detect and resolve identity theft, and, consumer rights within regulations. People nowadays accumulate and share more personal information that they can handle physically and emotionally. We continue to acquire and use more credit cards, refinance a mortgage an excessive number of times, and create hundreds of useless online accounts without thinking about the consequences. I call this "Identity Obesity" because instead of food, we excessively acquire and share personal information in an uncontrollable and addicted manner. Consumers are not always directly responsible with this identity obesity epidemic as aggressive marketing campaigns greatly contribute to consumers' identity obesity levels. With the introduction of the Internet, consumer credit revolution, and increased need to seek the professional help of personal service providers in daily lives, individuals increasingly accumulate, share and use more personal information while they lack the basic understanding of their identity theft risks. The combination of these factors along with aggressive marketing campaigns by big businesses have caused our society to become identity obese and led to record breaking identity theft incidents year after year. 2) learn about the best identity protection practices and solutions, and 3) learn about their rights. Note: The ebook is in PDF format and priced at $6.95. The purchased copy can be printed and shared within the same household but can not be distributed to others. To order hard copies of the book, please visit the publisher's website.